"He isn't any inconvenience but a living, breathing creature." Frank was in sad shape and it showed. The fifteen-year-old ginger and white tom was so famished and exhausted that he had collapsed in a garden on Dewsbury Road in Wakefield, West Yorkshire. He also was bleeding from his head on that fateful day in late November of last year and that in turn led those who had found him to initially believe that he had been mowed down by a hit-and-run motorist. Mercifully, that turned out not to have been the case. As for the injury itself, it apparently was not too serious even if its nature and how that he sustained it remain mysteries. Since he was neither wearing a collar nor microchipped, that made attempting to return him to his previous owner pretty much out of the question. 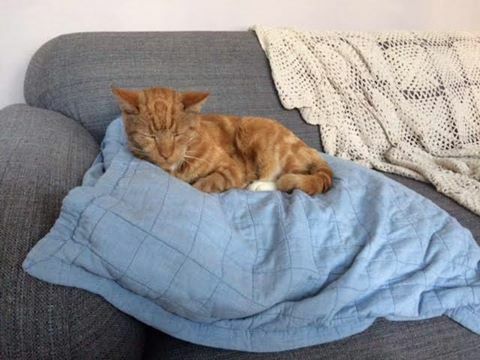 Luckily for him, however, Barbara Brotherton of Yorkshire Cat Rescue (YCR) in Keighley, forty-seven kilometers northwest of Wakefield, compassionately consented to allow him to stay at her house for a few days. "This old cat was completely exhausted and emaciated," she later told the Yorkshire Evening Post of Leeds on January 27th of this year. (See "Yorkshire Cat Rescue Rehome (sic) Stray Who's Suffering from Terminal Cancer.") "The vet suggested that I simply made him as comfortable as possible but I decided to go a bit further." The reason that the practitioner had so precipitately thrown in the towel on Frank is attributable to the fact that while examining him inoperable tumors had been found on both of his ears. Even if that did mean that his days were numbered, Brotherton nonetheless was determined to make them a good deal more than just comfortable. "Three mashed-up tins of cat food, a warm wash and a bed bath later, and this poor lad was all purrs," she testified to the Yorkshire Evening Post. Frank spent six days with her and her husband and their fourteen-year-old Alsatian, Mortimer, before he was transferred to YCR's shelter. "To say it was a pleasure to have known him is an understatement," she afterwards declared to the Yorkshire Evening Post. "He is a wonderful old gentleman who must once have been much loved by someone." Like everyone else who eventually came to know him over the course of the days and weeks that followed she was perplexed as to how a cat of his caliber could have fallen upon such hard times. "How he ended up like this is anyone's guess," she threw up her hands in exasperation. Although most any type of mischief, no matter how diabolical, is entirely possible when it comes to cats, the most likely explanation is that his former owner either died unexpectedly or deliberately abandoned him for some unknown reason. Usually incidents of this nature do not end well for elderly cats but in Frank's case he was blessed with the good fortune of having Brotherton to enter his life at his hour or greatest need. At YCR, he immediately was placed on a regimen of antibiotics and painkillers as well as treated for worms and fleas. As it had been the case with Brotherton, it did not take the staff long to become impressed with Frank's perseverance. 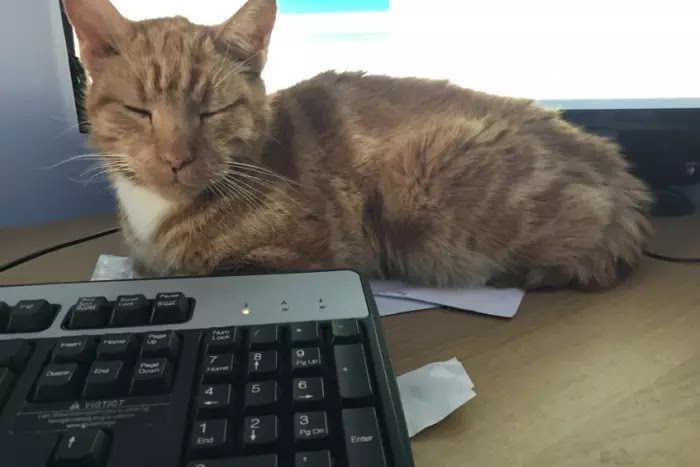 "Poor old Frank had had a tough life," the charity's shelter manager Sam Davies averred to the Yorkshire Evening Post. "We don't know where it began, and for how long he has lived as a stray, but it's certain at his age he was finding it too tough living on the street." That observation is certainly true enough in that if Brotherton had not taken him in his life very well could have ended in that garden in Wakefield. Regardless of all the deprivations and cruelties that he had been subjected to, Frank's kind and forgiving nature also was still very much apparent for one and all to behold. "Despite it all, he is one of the most loving cats we have ever seen," Davies marveled to the Yorkshire Evening Post. 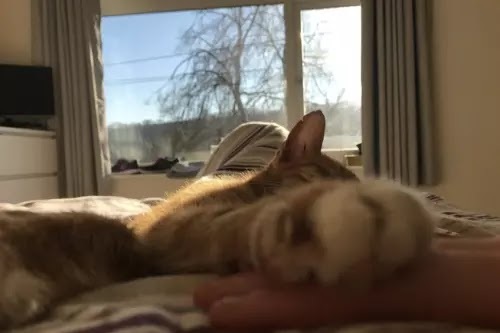 None of that, however, immediately translated into securing him a new home given that individuals who are willing to take on the awesome responsibility of caring for an elderly and ailing cat are about as rare as hens' teeth. Even YCR's generous offer to foot the bill for his continued veterinary care failed to attract any suitors. As a consequence, Frank was forced into remaining at YCR until late January when magnanimous Luke Turner of Halifax, twenty kilometers south of Keighley, learned of his desperate plight and decided to do something about it. "When I heard Frank needed a home, I just had to volunteer," he told the Yorkshire Evening Post. "This is a cat who probably doesn't have long to live. How can you not step up and give him that final bit of comfort?" Sadly, there are not too many individuals in this world who choose to look at the matter from that perspective. Besides, old and ailing cats do require specialized care but Turner, far from viewing that as an added burden, takes pleasure in attending to Frank's minimalist needs. "Right now, he is very weak; an old man who has had one hell of a life," he conceded to the Yorkshire Evening Post. "So we carry him up and down the stairs and do our best to spoil him." Perhaps it is attributable to all the months and, possibly, years of neglect but Frank particularly enjoys having someone to look after his skin and fur. "Frank loves a good scratch -- so much that the starts to dribble when he begins to purr," Turner added. Best of all, Frank appears to finally have found not only a loving but a forever home. "We won't put him through another change of home; this is where he belongs now," Turner declared to the Yorkshire Evening Post. "He isn't any inconvenience but a living, breathing creature." Such an enlightened and compassionate philosophy is refreshing and that is especially the case when viewed against the backdrop of the millions of cats that shelters, veterinarians, ornithologists, wildlife biologists, and PETA slaughter each year not only without so much as a second thought but with glee to boot. The same can be said for the fine work that is being done by YCR. "I do admire YCR for stepping in and saving this old boy, even with limited funds and resources," Turner concluded. Secondly, nothing short of an across the board ban on the killing of all cats by shelters and veterinarians will ever suffice. "If a child is in a situation where the parents can no longer care for that child whether the parents have financial issues, mental health issues, or they die, the government steps in and the state supports that child," Camille Labchuk of Animal Justice of Toronto explained the obvious to the CBC on May 22nd. (See "Advocates Calling to End Euthanasia of Healthy Pets for Owners' Convenience.") "Why we wouldn't do the same thing for vulnerable animals is beyond me." Owners likewise need to realize that caring for a cat is a lifetime commitment and that most definitely entails during both sickness and old age. Yet, Compassion Understood of Rugby in Warwickshire and its allies within the veterinary medical establishment are laboring hard in order to try and convince the public that killing cats and other animals is of no more moral consequence than tossing a pair of worn-out shoes into the trash. The goal of this morally bankrupt organization is to make the killing of "a pet as smooth and stress-free as possible" for both owners and veterinarians. Consequently, the organization has absolutely no regard for the rights, feelings, and desires of its legions of innocent victims. Every bit as difficult as convincing owners not to kill off their old, sickly, and simply no longer wanted cats, is the herculean task of persuading them to adopt cats like Frank, Harvey, and Grandpa Mason. In that respect, perhaps the best argument against such an ingrained prejudice is that individuals who turn up their long schnozes at such cats do not know what they are missing. As far as Frank is concerned, for example, neither YCR nor Turner expected him to be around for much longer. Their goal accordingly was primarily to provide him with a place in which to die. A warm and secure home, good quality food, topnotch veterinary care, and tons of love and attention can work wonders for cats who appear to have one paw in the grave and the other one on a banana peeling. In Frank's case, the tumors on his ears later were diagnosed to be benign and at last report he was still very much alive. "Happy, relaxed and much loved in his new home!" is how that YCR described him in an untitled article posted April 5th on its Facebook page. "Again, this is what we want for all the cats in our care." There accordingly are plenty of kudos to go all around. "Yay for Frank and yay for his new family that didn't hesitate to take in an older cat," the article concludes and no one ever could say it any better than that.